Or, there might be some pictures you took with your digital camera that you keep on the PC that you would also want to have available on the phone, too. After all, who wouldn't want to be always prepared to show photos of their pets on the phone, on a moment's notice? Your Android phone or tablet has probably come with some software that you could install on your PC to be able to transfer the image files back and forth, but chances are, such software is bloated, and it's either difficult to use or not flexible enough. And when you upgrade your phone or tablet to a newer device, why would you need to install and learn yet another user interface just to move the image files around? Wouldn't it be nice to have a universal tool that you could learn once and use with other devices, without the need to learn the device-specific programs every time? As a matter of fact, such a tool exists, and it is... a drum roll please... our AB Commander! Yes, you can use it not only to work with files and folders on your PC, but also with all kinds of external devices, including the Android phones and tablets. Let's see how it works. To begin, connect the Android device to the PC using its USB cable, and wait a few seconds. If nothing happens, or if Windows reports that it does not recognize the device, then you need to install a driver that lets Windows use your specific device. Go to the manufacturer web site and search for the driver to match the model of the device and the version of Windows that you have. Download and install the driver, then come back here. One such removable drive would represent the internal storage of the device, and the second one may represent the external storage card that you've inserted in the device. Which one is which? You can usually distinguish between them by, for example, analyzing the sizes of the removable drives reported by Windows; the one that matches the size of the storage card would obviously represent the storage card, and the other one would represent the internal storage. Of course, it your phone does not have the external storage, then you should see only one removable drive in the This PC folder. 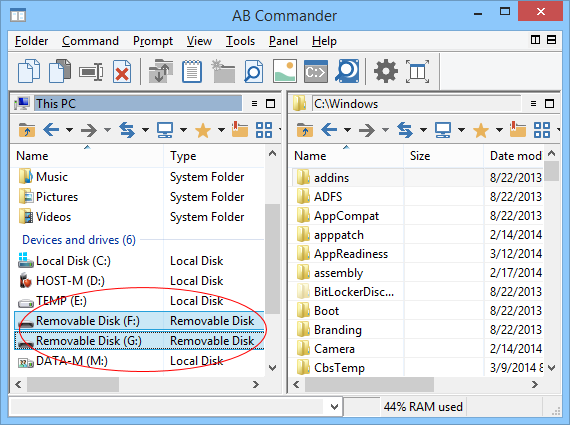 What is the difference between a virtual folder and a real folder, such as a removable drive, you might ask? Well, the real folders can be used for storing files and other subfolders directly, while the virtual folders are usually limited in one way or another. 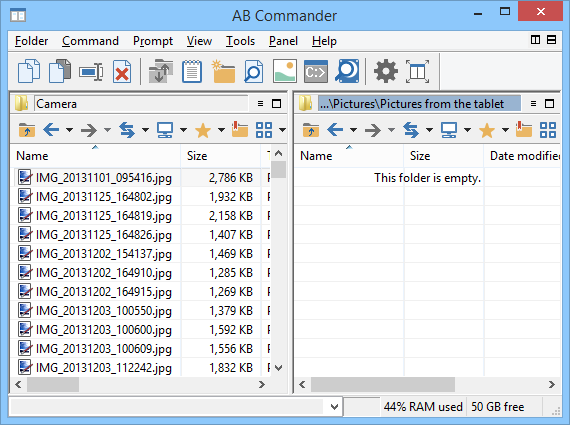 For example, the built-in image viewer of AB Commander works with images located within the real folders, but it cannot display them if they are located in the virtual folders. Many other tools may not work with the virtual folders, as well. 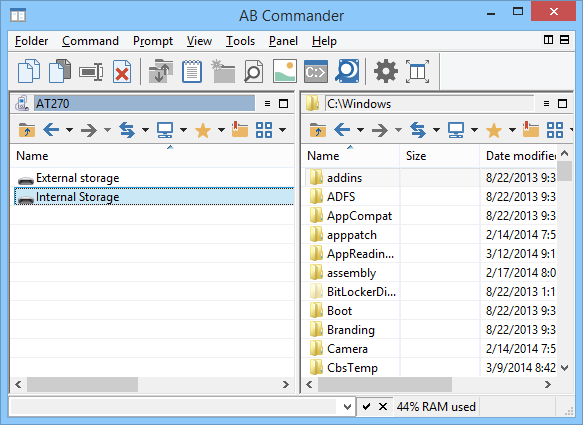 You need to use slightly different commands to work with the virtual folders, but don't worry, we will show you how. 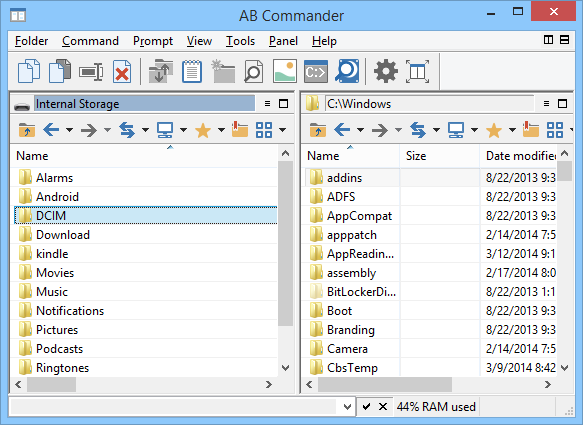 Now you can appreciate the dual-panel interface that AB Commander offers: you can use the two panels independently of each other, to navigate and browse different devices and different parts of the computer. Once you get both the source and the destination folders displayed side by side, it's easy to move the pictures from the Android device to the PC: just select them all in the source folder, and then use the mouse to drag and drop them onto the destination folder (displayed in the right panel in our example). 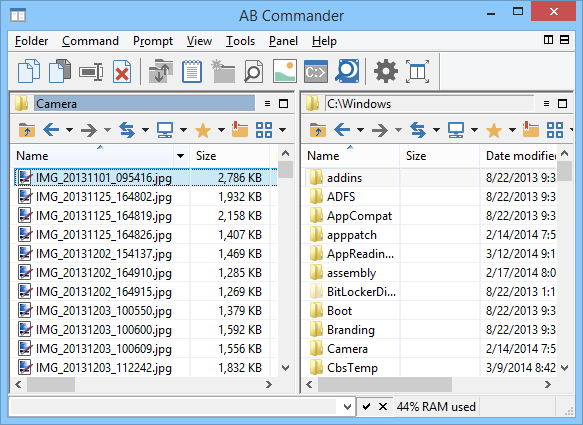 That's how easy it is to copy the images from an Android device to the PC. 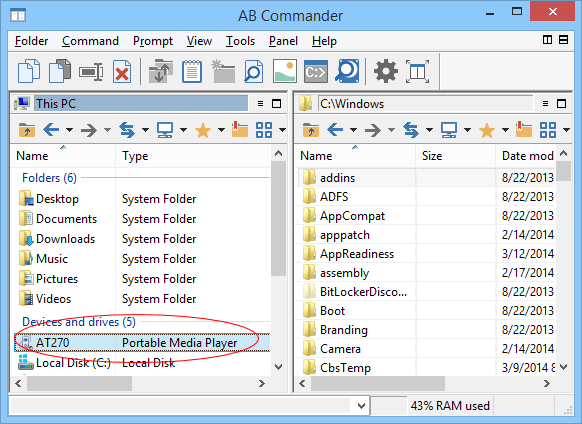 By the way, after the images have been copied, if you want to make room for the new images on the device, you can delete the old images from the device using AB Commander, as well: just select the images you want to delete, right-click on the selection, and choose Delete from the shortcut menu. This covers the copying of the images from the device to the PC, but what about transferring them in the other direction, from the PC to a phone or a tablet? We discuss that in the second part of the article. This all sounds awesome but iam looking for something easy enough for me to plug my phone cord into my windows xp and my usb cord from my android phone to put my pictures on my profile of facebook so i can show everybody my work. and when i get another printer i can print up my work for my craft shows and display also.